DinkNeSmith.com: Well, how Jesup are you? Well, how Jesup are you? That was like cranking a wrench on the top of a City of Jesup fire hydrant, letting memories gush out. Crossing his arms and leaning back, Derby listened—as I turned loose a stream. Towns have distinctive objects that are landmarks. 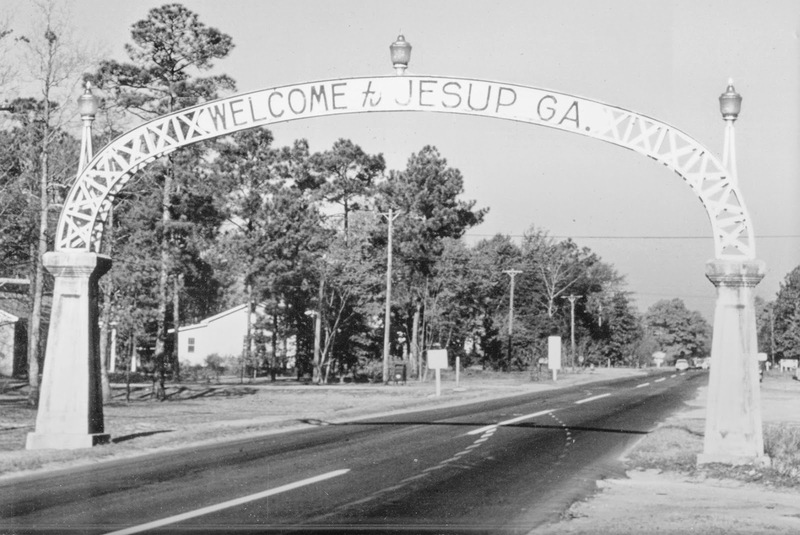 During my boyhood, the “Welcome to Jesup Ga” was one of those landmarks on East Cherry Street. As I remember, it was taken down in the 1960s. Later, a replica of the arch was erected at the new city hall that was once the post office. Today, the arch is in its new home next to the recently renovated train depot. And just as things become landmarks, so do people become distinctive signatures of a community. The Harris family is among those who have made their mark on Jesup and Wayne County. 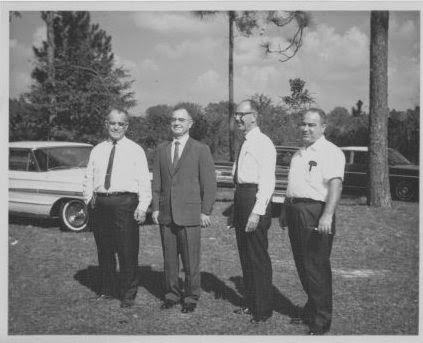 In this undated photo, brothers, from left, John Henry, Nick, Pierce and J.P. pose at a family reunion. The businessmen were entrepreneurs. Perhaps their most recognized brand was the Harris Gin Company. Years later, J.P.’s son, Raymond, launched Harris Ace Hardware in the old Wayne Freezer Locker building. Today, Raymond’s sons, Tim and Josh, along with other family members operate multiple locations of Harris Ace.